This Flame Sensor can be used to detect fire source or other light sources of the wave length in the range of 760nm - 1100 nm. 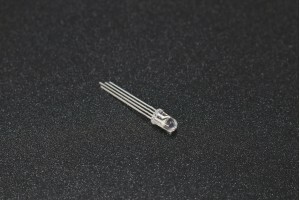 It is based on the YG1006 sensor which is a high speed and high sensitive NPN silicon phototransistor. Due to its black epoxy, the sensor is sensitive to infrared radiation. Sensor can be a great addition in a fire fighting robot, it can be used as a robot eyes to find the fire source. When the sensor detects flame the Signal LED will light up and the D0 pin goes LOW.